The Sacrament of Baptism celebrates rebirth of the soul into the Faith and the washing away of Original Sin. The Feast looks forward to the purpose of Christ’s life, His Death and Resurrection. 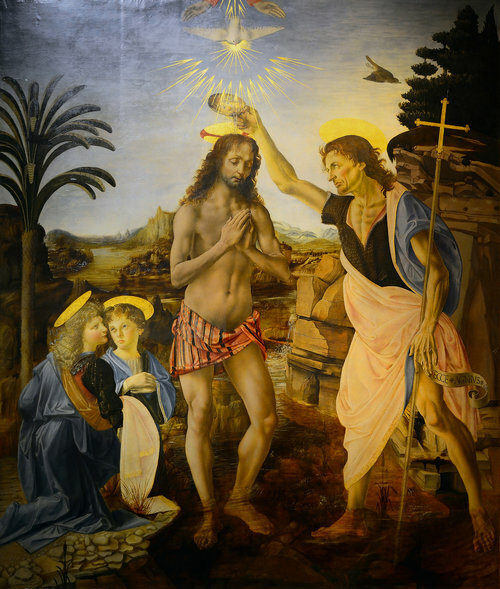 The Baptism of Christ is depicted in artwork with consistent symbolism and imagery. In the image above done by one of our artists at Canning Liturgical Arts, St. John shown baptizing Christ with a shell, a symbol for new life, below the same such imagery is depicted in paintings from the 15th century. The Holy Spirit descends over Christ and the Heavens are parted symbolizing the presence of Father, Son and Holy Spirit. The angel(s) pictured in paintings of the Baptism of Christ support the divinity of His nature while Christ humbly sets an example for humanity. When all the people were being baptized, Jesus was baptized too. And as he was praying, heaven was opened and the Holy Spirit descended on him in bodily form like a dove. And a voice came from heaven: “You are my Son, whom I love; with you I am well pleased.” Now Jesus himself was about thirty years old when he began his ministry. He was the son, so it was thought, of Joseph, the son of Heli, the son of Matthat, the son of Levi, the son of Melki, the son of Jannai, the son of Joseph.